Marijuana edibles are cannabinoid-infused food products that are consumed for medicinal and recreational effects. Edibles have become an increasingly popular method of cannabis consumption, especially for people who do not want to smoke or vaporize flowers. It is estimated that edible sales will account for up to 40% of all cannabis sales int the Nevada adult-use market. With the increasing popularity of edibles, it is important for consumers to understand how they work in the body, how their onset and duration differs from inhalation (smoking and vaping) usage, and how to select an appropriate dosage. One common misconception is that edibles are safer than smoking. While edibles can provide patients a great alternative to smoking, the effects from THC and other cannabinoids can be profoundly different from those experienced when smoking. Unfortunately, many consumers are unaware of this, which has led to some adverse reactions from people ingesting too much THC. There are three very important things to remember about edibles: they take significantly longer to produce noticeable effects, these effects can last much longer, and the effects can be considerably more intense than those experienced by smoking or vaping. The most abundant compound in cannabis is tetrahydrocannabinolic acid (THCA). THCA possesses some medicinal properties, but is non-psychoactive. Following heating or exposure to UV light, THCA is decarboxylated to form delta-9-THC (Δ9-THC). Δ9-THC is psychoactive and plays a significant role in producing the high associated with cannabis consumption. During smoking, heat decarboxylates THCA and the newly formed Δ9-THC can be readily absorbed through the lungs. Once Δ9-THC is in the bloodstream, it travels to cannabinoid receptors (CB1 and CB2) to produce various medicinal and psychoactive effects. The effects from smoking are rapid and tend to peak about 10 minutes following inhalation and begin to wear off over the next 30 to 60 minutes. The process for edibles is considerably different. First, cannabinoids are separated from raw cannabis flowers using a variety of extraction techniques (CO2, butane, distillation, cooking oils, etc.). During the extraction process, heat is applied to decarboxylate cannabinoids. The cannabinoid extract, which is now predominately Δ9-THC, is then cooked or baked into a food product. After ingestion, the edible goes through the digestive tract and the decarboxylated cannabinoids are metabolized in the liver. While in the liver, Δ9-THC is converted into 11-hydroxy-THC (11-OH-THC), which is released into the bloodstream and travels to interact with CB1 and CB2 receptors. 11-OH-THC can cross the blood-brain barrier more easily than Δ9-THC and has been described as 2-10 times more potent than Δ9-THC. For edibles that go through the digestive tract, the onset of the more pronounced effects usually take 45 minutes to 2 hours. Since 11-OH-THC more easily passes through the blood brain barrier, effects tend to be more intense and can last anywhere between 3 and 8 hours. Lozenges, tinctures, and sprays are other types of cannabis-infused products typically associated with the term edibles. These products enter the bloodstream through buccal absorption in the mouth and, because they are effectively directly absorbed into the bloodstream, produce similar effects to smoking or vaping. Lozenges, tinctures, and sprays are decarboxylated during production so they contain activated cannabinoids including Δ9-THC. During consumption, some of the Δ9-THC is processed through the digestive tract to produce 11-OH-THC, but the majority remains as Δ9-THC. Since most of the cannabinoids do not get metabolized, the effects can be felt faster than edibles that travel through the stomach. The effects of lozenges, tinctures, and sprays can last longer than smoking or vaping, most likely due to the presence of some 11-OH-THC and an extended release effect, introducing cannabinoids into the bloodstream over a much longer period than smoking. Another important consideration when comparing the effects of smoking and edibles is the presence of terpenes. Terpenes are the chemicals that give cannabis its flavors and scents. They also play a critical role in producing strain-specific effects such as making a person feel sleepy, euphoric, hungry, energetic, etc. Cannabis flowers can be rich in terpenes, but edibles contain virtually none since they are lost during the extraction and decarboxylation process. The absence of terpenes also contributes to the different type of “high” most people experience when using edibles versus smoking. Edibles tend to produce more of a body high rather than a cerebral head high; however, this can differ from patient to patient. Unfortunately, some consumers have experienced adverse events with edibles. In almost all cases, the patient ingested too much Δ9-THC and potentially other cannabinoids. Reported effects from over consumption range from lethargy and sleepiness to irritability and disorientation. It is important to give the edible enough time to reach the bloodstream before deciding to consume a second dose. A depiction of the general effects of these consumption methods and the ‘highness’ effect experienced is provided in Figure 1. Smoking induces a rapid high, which dissipates in a relatively short amount of time. On the other hand, edibles that pass through the stomach take much longer to produce noticeable effects, but this high can last longer and be more intense than smoking. There are many variables that influence how a person responds to edibles. Because each person is different, it is very important to educate consumers. A first-time user of edibles needs to start off with a lower dose to find the minimum dose necessary to achieve the desired effect. Adverse events can be avoided if consumers approach edible dosing with caution and slowly find the appropriate amount to consume. 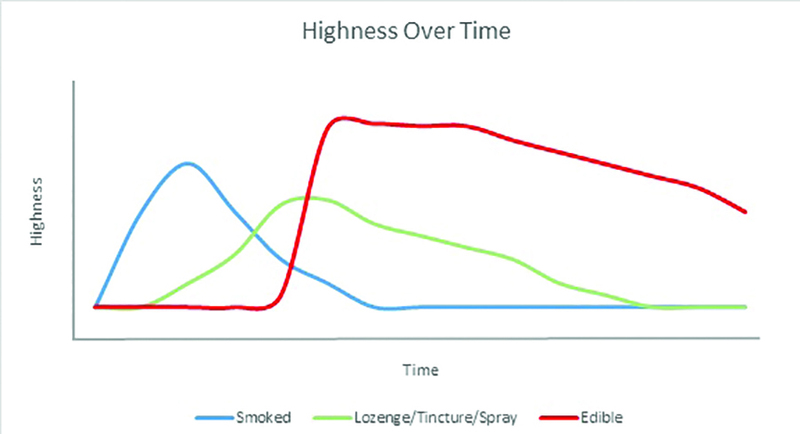 Figure 1: ‘Highness’ Over Time: Each consumption method produces different levels and duration of highness. It is important that patients consume edibles with caution to avoid adverse effects.